I took this photograph in Jackson Heights, Queens, New York located on 94th street and Sister Mary Patrick McCarthy Way / 35th avenue. Walking by this street every once in a while gives me a chance to reminisce great memories due to the fact that I was raised here for 18 years and that I went to Blessed Sacrament School which is now called P.S 280. I moved to Rego Park , Queens this year which is 30 minute commute by train to get to Jackson Heights. However, when I do come visit my old neighborhood, Jackson Heights, to visit my family or friends, I always walk down by this street. 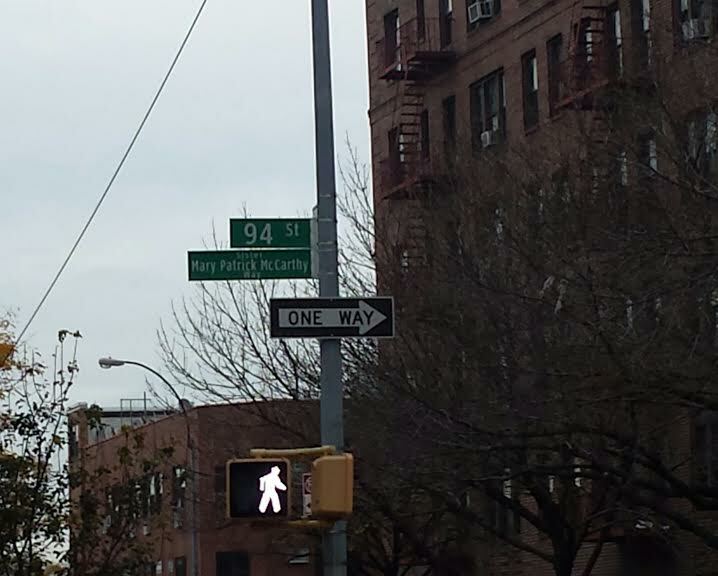 On November 18, Council member, Daniel Dromm, who represents Jackson Heights, revealed the street co-naming of Sister Mary Patrick McCarthy. It was passed by the New York City Council and signed by Mayor Michael Bloomberg on October 2, 2012. This former nun and school principal is being commemorated for helping out immigrants, senior citizens, the homeless and of her commitment to Catholic faith and values. Sister, Mary Patrick McCarthy had a long struggle and unfortunately died of breast cancer in 2002. It is now 2015 and she is still being honored for the many good deeds she has done to the Jackson Heights community. Every time someone will walk down this street, they will remember her for the good person she was inside and out. Rest in peace Sister Mary Patrick McCarthy. I took this photograph on the corner of Fulton Street and South Portland Avenue in the neighborhood of Fort Greene, Brooklyn. This mural was painted by street artist, Cern One. In this mural, Christopher Wallace aka Biggie Smalls is being commemorated. 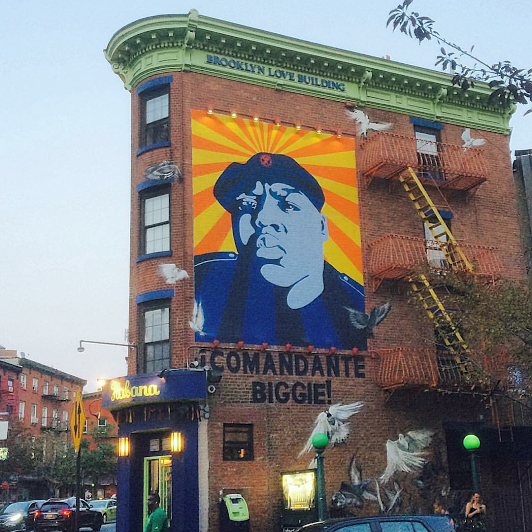 It shows Biggie Smalls signature pose and underneath in capital letters Comandante (in spanish) Biggie which means Commanding Biggie. It combines Biggie Smalls with a meaning of the South American revolutionary Che Guevara. Biggie Smalls was one of the most influential hip hop artists of all time. Unfortunately, on March 7, 1997, Wallace was killed by in a drive in shooting in Los Angeles, California and was only 24 years old at the time. Right now he would have been 43 years old if he were still alive at this moment. Overall, I think Cern One did a very beautiful mural of him. When everyone walks by Fulton Steet and South Portland Avenue, hip hop fans will remember him for the great legend he was. Rest in peace Christopher Wallace aka Biggie Smalls. I took this photograph in World Trade Center site located at 180 Greenwich Street . 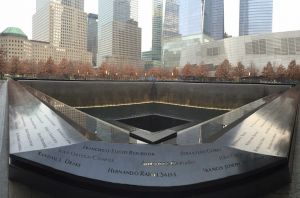 This memorial pool commemorates all the citizens names inscribed that died on the September 11 attacks. It is a reminder of the attacks, giving everybody to visit a place to honor, grieve, and to remember forever. Some of the names I saw on the pool were Francisco Eugio Bourdier, Juan Ortega Campos, Randall L. Drake, Hernando Rafael Salas, Alejandro Castano, Sebastian Gorki, Joni Cesta, Francis Joseph, and many more. I remember on September 11, 2001 I was with my kindergarten class sitting and having to go home early. When my dad picked me up from school he took my home and told me something terrible had happened. Being five years old at the time I did not really understand. Now I am 19 years old and I understand what truly happened. It is heartbreaking, that a lot of lives were lost that day not knowing this incident would have occurred. May all these individuals rest in peace. I took this photograph in 27 State Street in Brooklyn. Adam Yauch, Beastie Boys founding member, is being commemorated by having a park named after him. 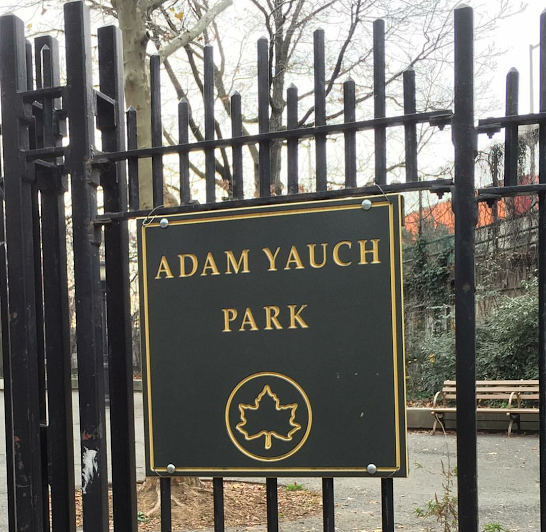 This park used to be called State Street Park to Palmetto Playground but since Adam Yauch, passed away in April 2012, they changed it to Adam Yauch Park. 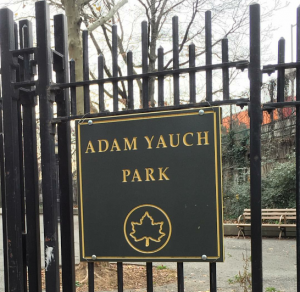 Adam Yauch grew up playing at this playground and it is fascinating to have his own name in a park where he fulfilled so many memories in. Besides founding the Beastie Boys withAdam ‘Ad-Rock’ Horovitz and Mike ‘Mike D’ Diamond, he also formed the Milarepa Fund that produced the Tibetan Freedom Concert benefits, and developed the film production and distribution company Oscilloscope Laboratories. Everytime someone will go to this playground they will remember Adam Yauch for the great artist, musician, film maker and activist he was. Rest in Peace Adam Yauch. I took this photograph in Bowery and East Second Street. 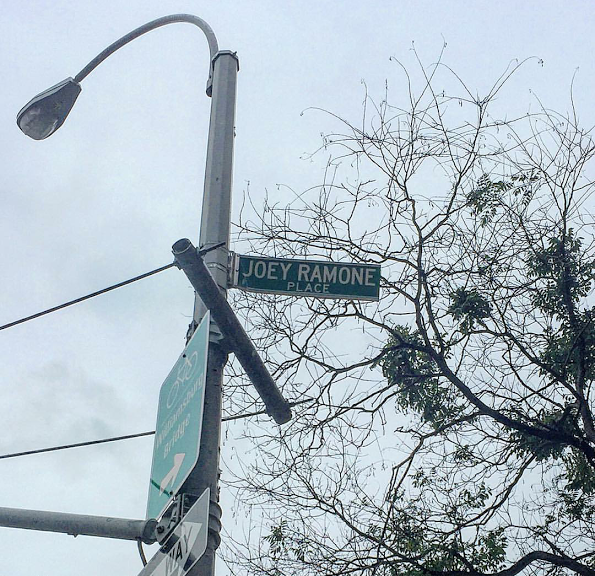 On November 30, 2003, New York City councils Alan Jay Gerson and Margarita Lopez officially named Joey Ramone Place in honor of this punk rock legend who was lead vocalist of the band, The Ramones. Joey Ramone passed away on April 15, 2001 with his long battle of cancer. This street is a reminder of Joey’s Ramone’s devotedness and love for the East Village and how much he pushed young bands to live their dream as he did with The Ramones. It has been said that this street sign has been stolen various times, making it the most stolen street sign in all of New York City. Each time it was stolen, it was replaced at a higher spot. As of right now it is currently sitting about 20 feet above street level. May Joey Ramone rest in peace and his memory live forever. This entry was posted in Uncategorized on November 8, 2015 by Gina Delgado.